A basic measurement in groundwater studies is that of water levels in wells. Water level measurements help determine flow directions, identify changes in gradients and seasonal fluctuations. They are also used during aquifer testing, and measurements related to groundwater sampling. 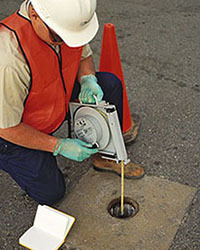 The measurement of the groundwater level in a well is often conducted in conjunction with groundwater sampling to determine the “free” water surface. Groundwater level and well depth measurements are needed to determine the volume of water to be purged or in monitoring drawdown in the well casing for low flow sampling. 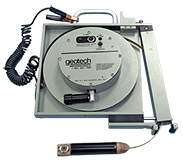 Geotech designs and builds electronic water level meters – This type of instrument consists of a spool of dual conductor wire attached to a coated steel measurement tape, a sensor probe attached at the end, and indicator electronics. When the probe comes in contact with groundwater the circuit is closed and a light and audible buzzer attached to the spool will signal contact. The meter uses a 9 volt battery as the power source. Accurate measurements can be made to 3mm (1/100 of a foot). Oil-water interface probes monitor wells for the presence of separate phase product prior to purging. An interface probe is an electronic probe designed to detect the electrical conductivities of different fluids to determine the depths to LNAPL/water interfaces. This data is used for site characterization studies to determine remediation strategies and monitor current remediation efforts. 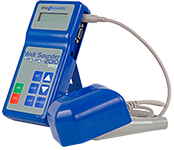 The Eno Scientific Well Sounder 2010 Pro is a portable sonic water level meter that uses sound waves to measure static water levels in wells, piezometers, and boreholes. The instrument features an internal data logger that can be configured to log manually or automatically at time intervals. If there are known defects in the well, the Well Sounder Pro can be set to ignore interferences. Simply place the sensor into the well vent opening and within seconds static water depths are displayed. Colloidal borescope systems provide a direct means to accurately determine groundwater velocity, flow direction and particle sizes at depth-specific intervals. The colloidal borescope yields thousands of data points per minute for hours of statistically assured data. The borescope measurements use existing monitoring wells for assessment and thus avoids the cost of additional wells and piezometers. Instruments that are ideal for long-term monitoring. Water levels can be collected at user-defined time scales without making individual manual measurements. Small size allows water levels to be measured in wells or piezometers that are of small diameter, crooked, angled, or that contain pumps or other equipment. 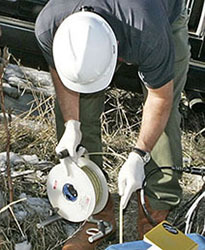 The data logger can be left unattended for prolonged periods until data can be downloaded to a portable computer in the field. Some pressure transducers with integrated data loggers are small enough to be placed inside the protective well casing and do not require a separate shelter. Good for high visibility, secure, or below-ground installations. Downloaded data can be imported directly into a spreadsheet or database. Can be interfaced with a DCP to transmit data collected via satellite for near real-time data reporting. Can be installed in a flowing well. Global Water Flow Probes are highly accurate water velocity instruments for measuring flow in open channels and partially filled pipes. The water velocity probe consists of a protected water turbo prop positive displacement sensor coupled to an expandable probe handle with a digital readout display. The water flow meter incorporates true velocity averaging for the most accurate flow measurements. Use for measuring flows in rivers and streams and monitoring velocity in ditches and canals. SonTek, advancing environmental science in over 100 countries, manufactures affordable, reliable acoustic Doppler instrumentation for water velocity measurement in oceans, rivers, lakes, canals, harbors, estuaries, and laboratories. SonTek instruments use sound waves to measure how fast water is moving, where it is moving, and even if it is not moving at all. SonTek customers are scientists, engineers, hydrologists, research associates, water resource planners and anyone that needs to collect velocity (speed) data in every kind of body of water.